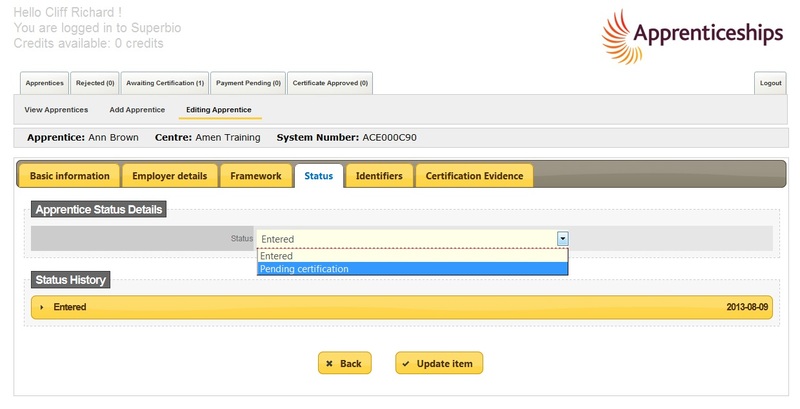 The Federation has developed a centralised payment system for all Apprenticeship completion certifications processed on the ACE system. 1. Pre-pay by credit card. 3. 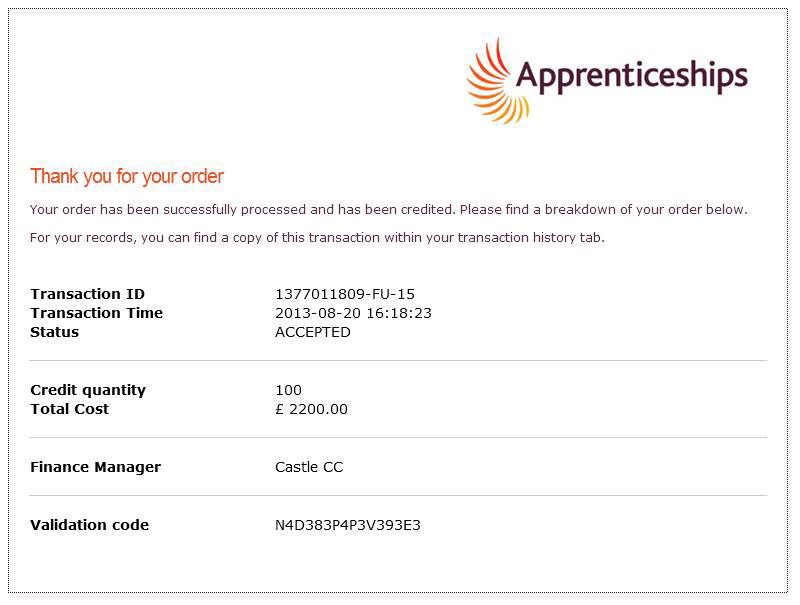 One off payment (pay as you go (PAYG)– This option will allow you to use a credit/debit card to pay for the certificate when you submit the Apprenticeship certification claim for approval. Please contact cps@fisss.org with any queries about the Central Payment System. completion certifications processed on the ACE system. to a balance on the ACE system, and deducted when certificates are processed. What is a Finance User? 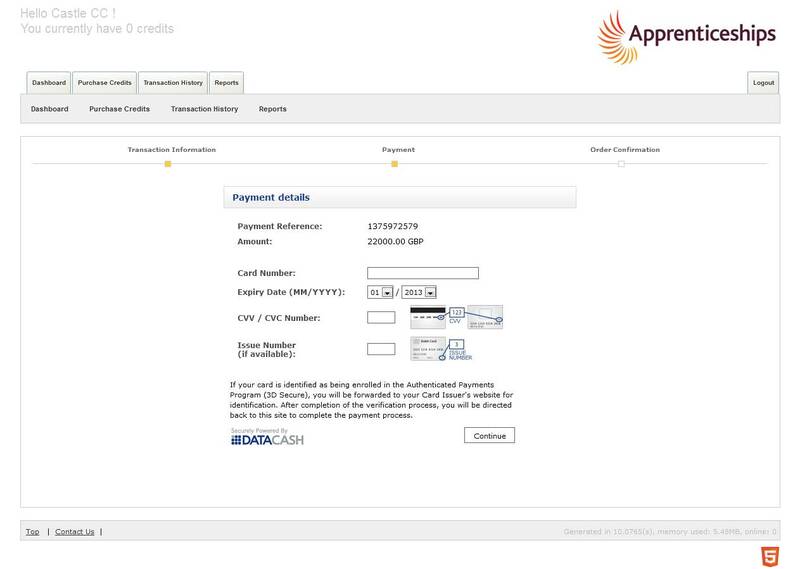 A Finance User is the only person within the training organisation who will be authorised to purchase credits for Apprenticeship certification. To become a Finance User you will need to request log in information by completing this form. 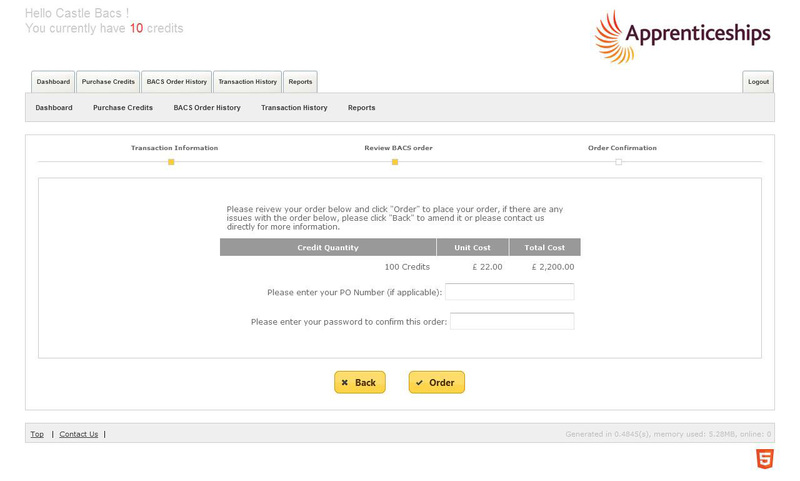 The Finance User will only need to log into the payment system to pre-pay for credits. Once credits have been purchased the credits will be allocated to the Finance User and be accessible to associated ACE Users. To prepare for the implementation of the Central Payment System you can now register as a Finance User for your centre. If you are going to purchase credits in advance only one person within the training organisation will be authorised to purchase credits for Apprenticeship certification and will normally be assigned to the Finance User role. To register as a Finance User please complete this form. 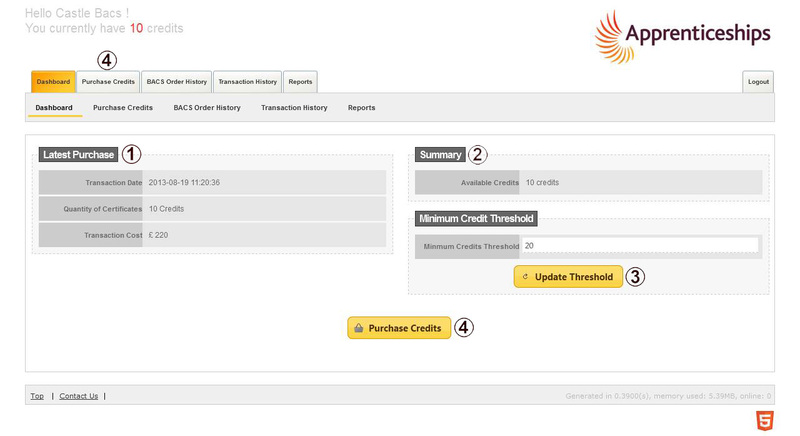 Once logged into the central payment system you will see the dashboard homepage summarising recent activity in purchasing credits. The Latest Purchase details basic information of your previous transaction. The Summary of credits details current credit levels and how many have been used. The Minimum Credit Threshold is managed by the Finance User and is designed as an indicator to notify the Finance User and ACE administrator(s) when the credits are running low. To set the Threshold enter the minimum number into the box and click the yellow Update Threshold button. 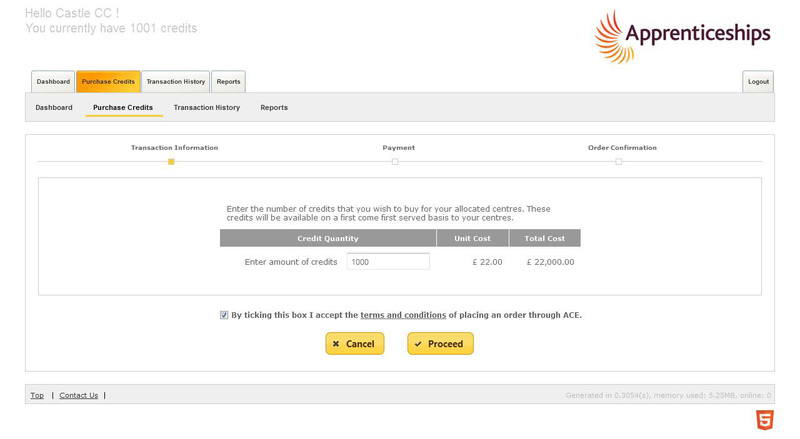 In order to purchase credits you will need to select the option to Purchase Credits by either selecting the tab at the top of the page or the yellow button at the bottom of the page. If you choose to pay for certificates using this method, you will be able to purchase credits for all of your ACE administrators to access. Each time an administrator submits an apprentice for certification one credit will be deducted. The yellow square indicates what stage of the process you are at. Enter the amount of credits that you would like to purchase. The system will automatically calculate the total cost based on the £22 unit cost. You will need to accept the Terms and Conditions by ticking the box before you can proceed. To view the terms and conditions please click the underlined link. Once you are happy with the order, click the yellow Proceed button. Once all the details have been entered select the option to Continue. The system will then verify the details that you have entered before confirming the order. You may at this stage be directed to 3D Secure which is linked to your bank. If you are, please complete the details and submit. Once you submit you will return to the central payment system. 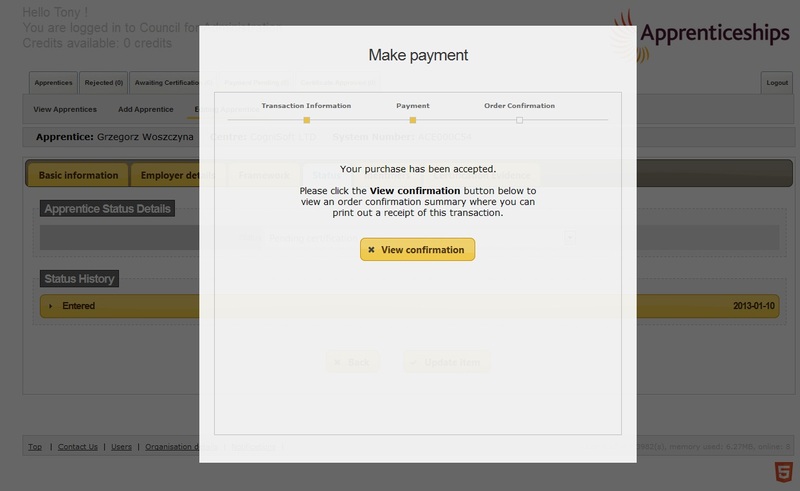 You will be notified when the payment has been accepted and you will be able to view confirmation of the payment by selecting the view confirmation button. The confirmation will be displayed and a unique order number will be assigned to the transaction noted at the top of the order platform. 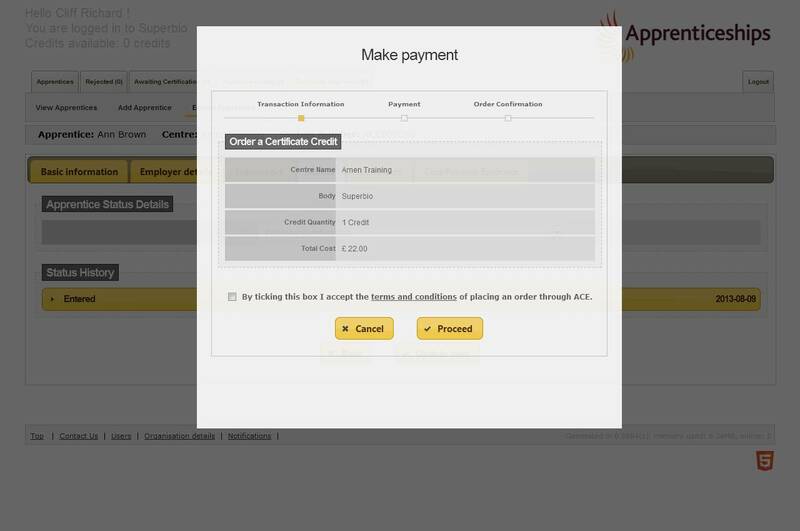 You also have the option to print confirmation by selecting the yellow Print Confirmation button. The receipt also provides you with a validation code. This code is for you to track payments with your bank. There are no minimum/maximum limits to the amount of credits that you purchase or how often your purchase them. These will be down to your individual organisational preferences. Under the Transaction History tab you will be able to view all completed transactions since the account was activated. By double clicking on an individual transaction you will be able to view basic information regarding the transaction as well as having the option to print this page. As the Finance User for the organisation you will be able to purchase credits that will be available for all ACE administrators to use. This includes the ability to purchase credits for multiple centres that may be within the organisation, although this will need to be agreed with the Federation when registering for the payment system. You will then be given the opportunity to review the order, check the amount of credits you wish to purchase and the total cost of this. Here you have the opportunity to include a purchase order number. This is not a mandatory field but may be used if your organisation uses purchase orders. 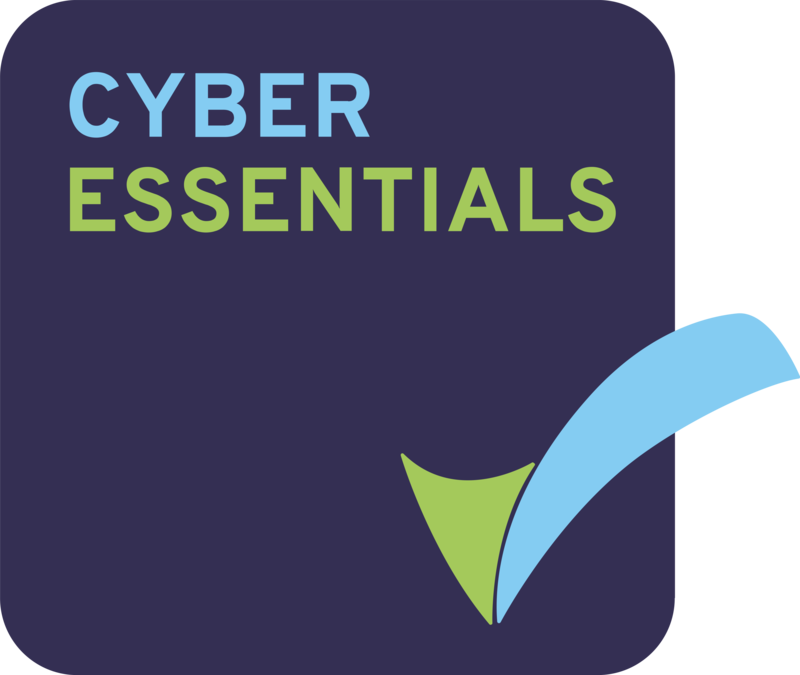 In order to try and minimise errors you will be required to re-enter your password before proceeding with the order. 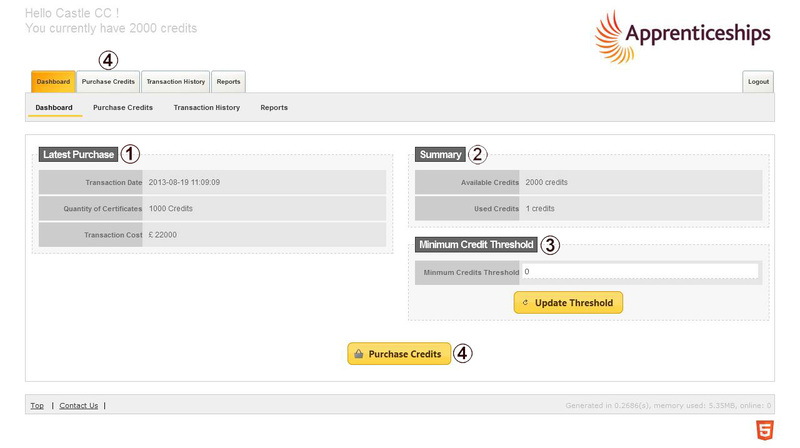 If you have entered an incorrect amount of credits required you can select the back option to amend the credit amount. 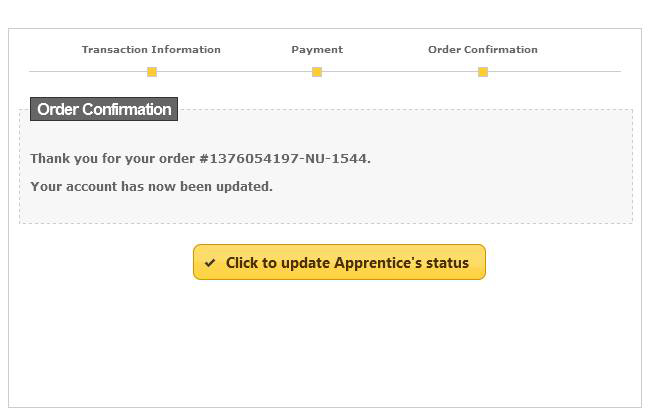 Once you are ready to complete the order you will need to confirm the order by selecting the yellow Order button. When you have confirmed your order you will be directed to the Order Confirmation page. This page summarises the details of your order and provides you with a unique Submission Reference (in red) that relates to your order. This Submission Reference number needs to be included as a reference in all BACS payments made so that we can reconcile the payment to your finance account and allocate your credits. 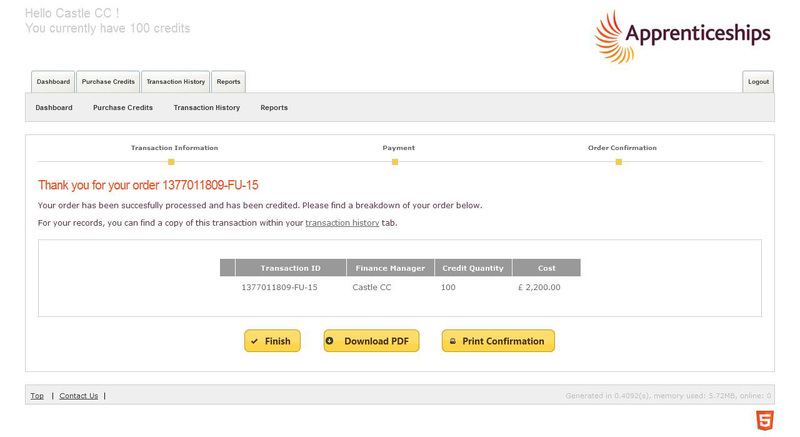 You can print this order confirmation by selecting the Print Confirmation button. If you do have a need to contact the Federation regarding your order you will need to have this Submission Reference number available. 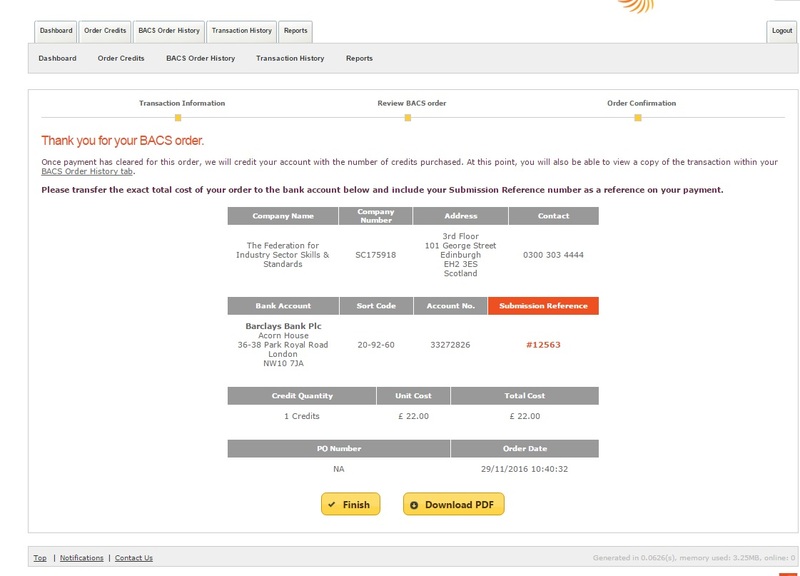 You can also view all credit orders made under the BACS Order History tab. You can view all transactions within the Transaction History tab. This will keep track of all orders made and the status of orders. Please note: until the Federation has received payment and allocated your credits the transaction will not be listed under the Transaction History tab. The Federation will monitor BACS payment on a regular basis and, therefore, credits will be allocated to your ACE account within 24 hours of receiving the payment. If you are only processing a small amount of certificate requests at a time you may prefer to use the pay as you process payment method. This method will automatically initiate once you select the apprentice to be submitted for certification under the Status tab. When the apprentice’s ACE record has been finalised with all mandatory requirements and the certification evidence completed you will need to submit the request as you previously have done through the Status tab (further details on how to use ACE can be found here). The validation pop up will appear as normal. This indicates the mandatory fields and highlights if there are any areas that are missing information. Select OK and a payment pop up will appear. These are listed across the top and the yellow square indicates what stage of the process you are at. 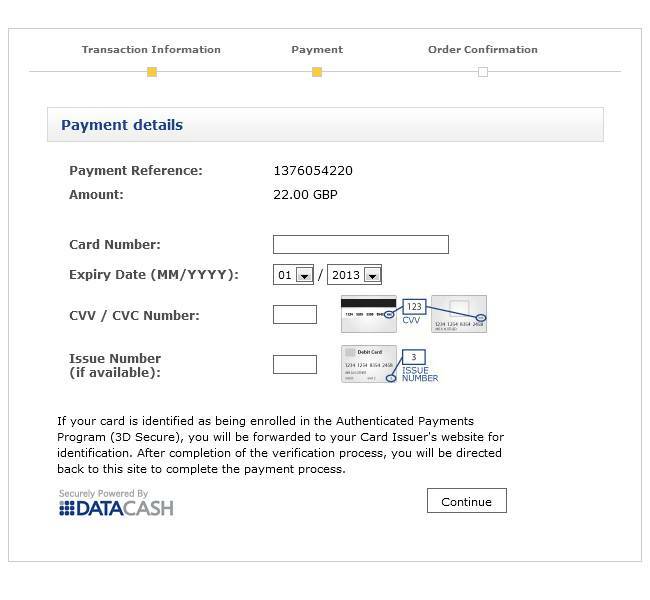 The transaction information will be auto- calculated for you based on one certificate cost of £22. You will need to tick the box to agree to to the Terms and Conditions (which can be viewed by clicking on the underlined link) when ordering a certificate on ACE. To move onto the Payment details you will need to select the Proceed tab. You will need to enter the card details that you wish to pay with. Once all the details have been entered select the option to Continue. The system will then verify the details that you have entered before confirming the order. The pop up will provide you with a Payment Reference that you can keep for your records. You may at this stage be directed to 3D secure which is linked to your bank. If you are, please complete the details and submit which will return you to the central payment system. You will see the display that informing you that the payment has been accepted. You can view the confirmation of the transaction by selecting View Confirmation. You will be provided with an Order Reference which you can keep for your records. 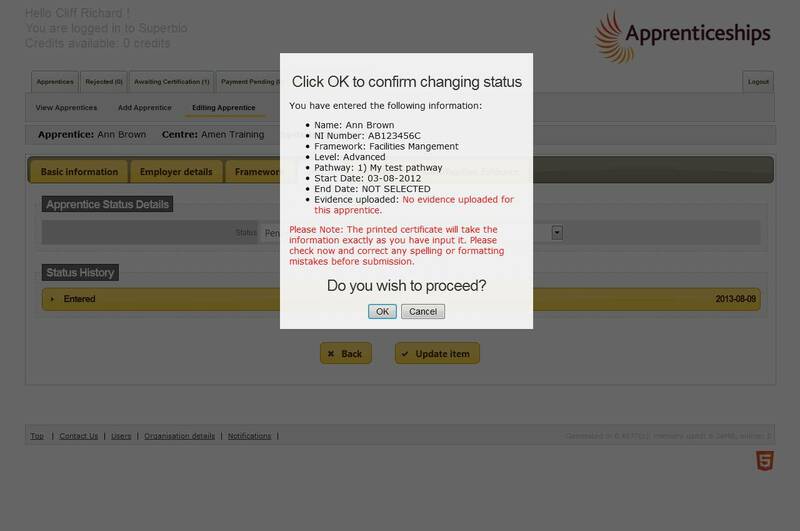 When you have finished this process, select Click to update Apprentice’s status which will return you to the apprentice’s record and submit the request to the Certification Body. To help with the transition to our new Central Payment System we have created three video tutorials which explain the different payment options. Click here for more information on the Central Payment System.